If you planning or organize a party under the tent then quality of a tent is one of the most important aspects. When you buy or hire tent from a retailer then check out manufacturing equipment. If you go with Indian Tent, you get everything is managed in a proper way. 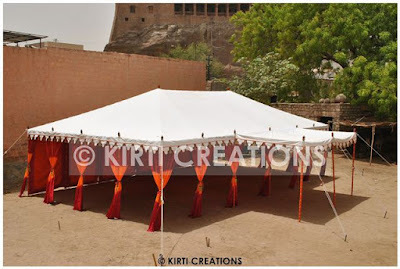 Waterproof Raj Tent:- Waterproof Raj Tent is made from waterproof canvas that protect to your party from rain. It is so beautiful and quality tent. It is designed from white and maroon color of fabrics. That suit to your all needs and requirement of the party. Indian Tent Suppliers is world famous for best quality of tents is supply from all the globe. Indian Tent offers a Handmade Tent with wide collection of design, pattern and shape at the budget price. Indian Tent is top tent company of India that has been famous among the customers and maintain our relationship with customer and supply the standard quality of tents.